Irish food tends to get a bad rap. I don’t get it. We had wonderful meals when we visited Ireland, and particularly enjoyed the various homemade breads, fabulously fresh seafood, and just-picked seasonal vegetables. Fresh, simple food that is deeply satisfying. Since our trip, I’ve been experimenting with different Irish recipes. I picked up a lovely cookbook – “The Food & Cooking of Ireland” by Biddy White Lennon and Georgina Campbell. This highly addictive Potato Cake recipe was adapted from one of their luscious recipes. Use golden potatoes for a sweet, mellow flavor, and cook them a bit longer than you might for simple mashed potatoes. Serve them warm, for real potato comfort, and to enhance the buttery, nutty taste. 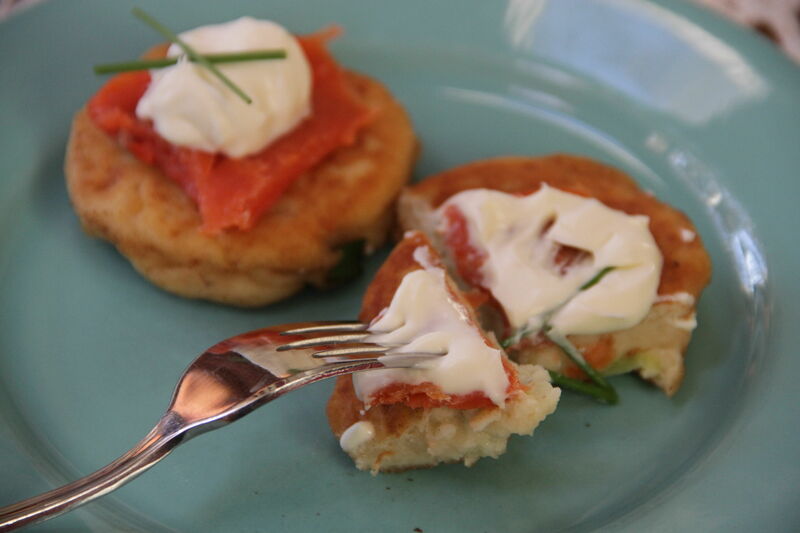 Smoked salmon is amazing atop these little cakes, but you should also try various toppings (or just gobble them up plain as I did while cooking them for the first time) – different fishes, meats or even cheeses. Make it easy on yourself and cook them up the day before, then in the morning, simply heat and assemble for a deeply satisfying breakfast in bed. Peel, wash and dice potatoes. Place in a heavy pot and add water to cover and a dash of salt. Bring to a boil over high heat, then simmer until potatoes are tender, about 10 to 15 minutes. 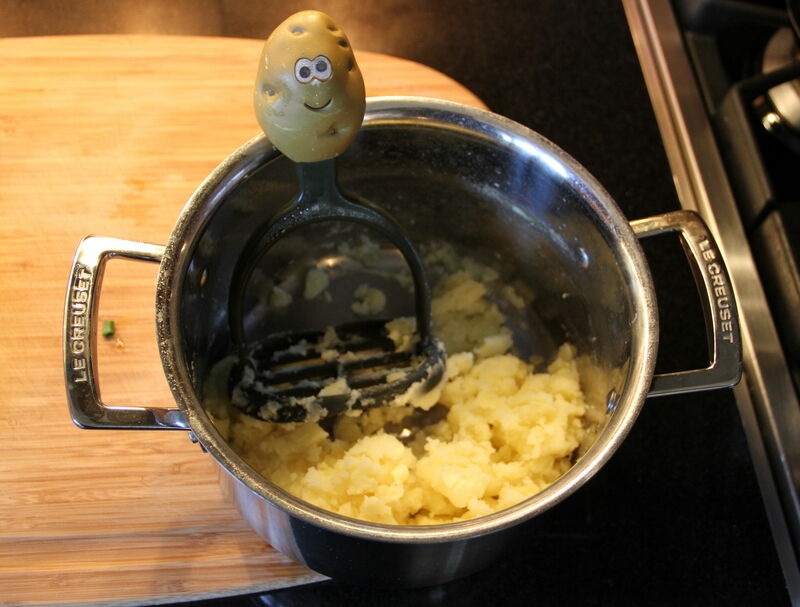 Drain, return to pot and mash, ensuring potatoes are smooth and without lumps. Crack eggs into a small bowl and whisk. 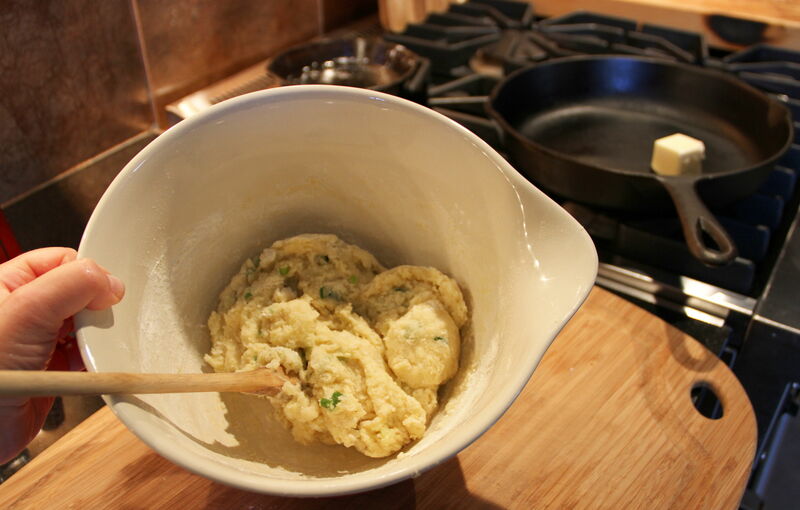 Stir whisked eggs, melted butter and green onions into the mashed potatoes. Season with salt, pepper and nutmeg. Stir in flour and mix thoroughly to form a stiff dough. With lightly floured hands, shape potato mixture into 12 small cakes (approximately 2 to 2 ½ inches in diameter). Melt the remaining butter in a heavy pan over medium heat and cook the potato cakes for four to 6 minutes, until browned on both sides, turning once. 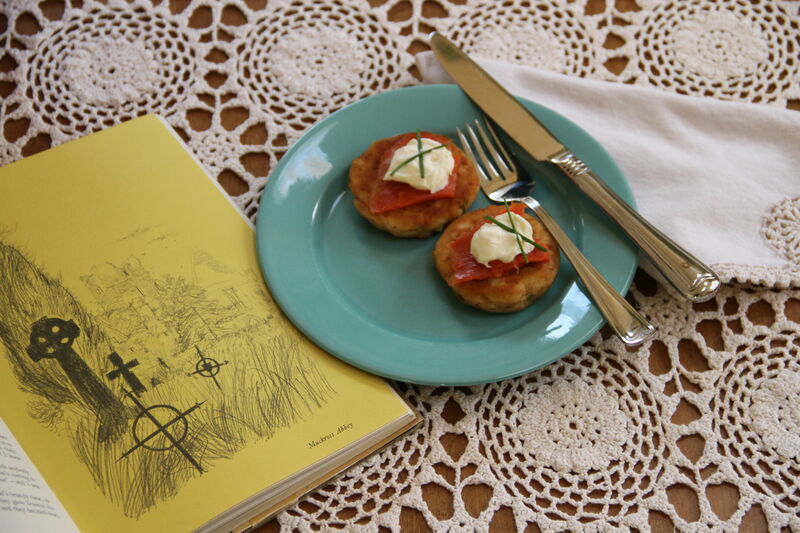 To assemble, place a small piece of smoked salmon on top of each potato cake. Top with a dollop of crème fraîche or sour cream and garnish with chives. Serve warm. 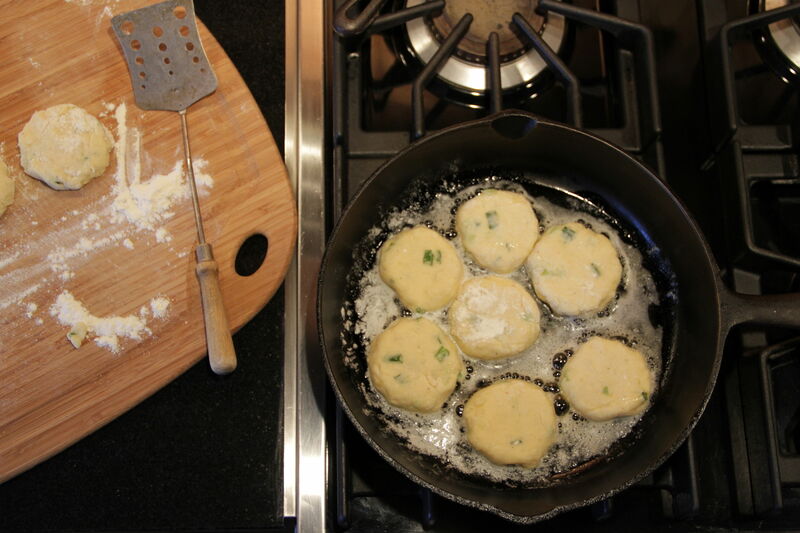 NOTE: If you like, make the potato cakes the day before and refrigerate until ready to use. Reheat them in a 350°oven for 15 minutes before assembling and serving.